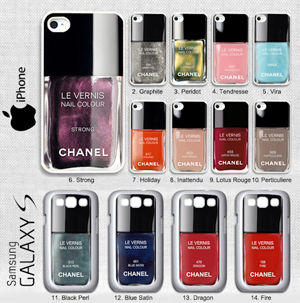 Dress your iPhone or Samsung Galaxy colors of Chanel nail polish? It is possible! Etsy site full of a thousand original works of all kinds, like the hulls smartphone printed bottles of Chanel polish. What match his mobile phone to his favorite polish color! Plenty of choice sides colors! Examples include varnishes Chanel Miami Peach 203, 461 Blue Satin, Red Dragon 475 rose Tenderness 507 Rose Insolent 489 Rose Exuberant 519, 535 May rose, yellow or orange Mimosa 577 Holiday 617.